Carol Morales hadn't planned to celebrate her 80th birthday at work. But her colleagues couldn't let the milestone pass without a proper celebration for the woman they call an "inspiration." Carol Morales sat down to enjoy a bowl of Cheerios, just as she does each day during her morning break at Mayo Clinic's Arizona campus. But this was no ordinary day. It was Morales' 80th birthday. 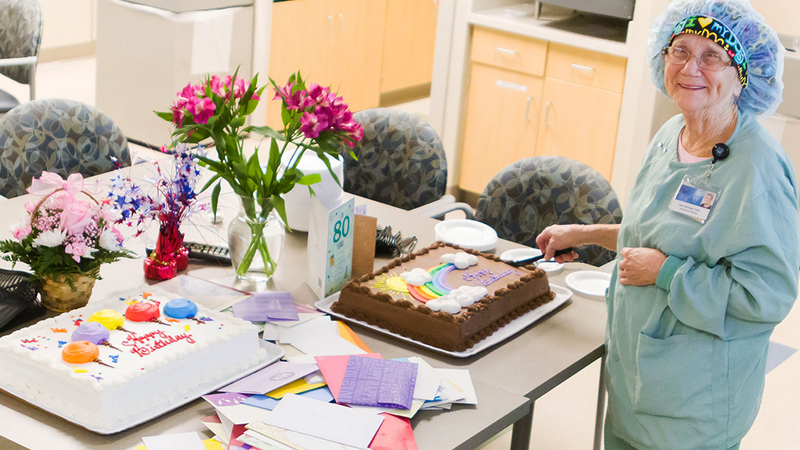 And soon her regular routine was interrupted as her Operating Room colleagues began streaming into the breakroom with flowers, cakes and cards. Lots and lots of cards. "Our Carol works so hard, we just wanted to show her a little appreciation," Christina England, Operating Room supervisor, tells us. She and her colleagues decided a fun way to do that would be by collecting 80 birthday cards, one for each year of Morales' life. When the big day arrived, there were nearly twice that many. "I was trying so hard not to cry," Morales tells us. No luck there. "Carol was in such shock that she was actually brought to tears, as many of us were," England says. "She is beloved by everyone." Despite the number of candles on her birthday cake, Morales is "an incredibly youthful colleague" and "an inspiration to all of us in the surgical services department," Shari McCormick, a nurse on the unit, tells us. "Her smile is contagious and her work ethic is unrivaled, by anyone, at any age." England agrees. "Carol keeps up with all of her younger co-workers, some of whom could be her great-grandchildren." It would be the highlight of our week if you left a comment below. Then use the social media tools atop this page to share this story with others. Check out careers at Mayo Clinic. Wow!! Happy Birthday Carol! What an inspiration you are to the rest of us nurses. Blessings from Kansas.